ANC 3E Meets Tonight, Major Development Projects on Agenda | Tenleytown, D.C.
On the agenda for tonight’s Advisory Neighborhood Commission 3E (AU Park, Friendship Heights, Tenleytown) meeting are two major mixed-use development projects. Valor Development will provide an update on its plans for a residential and retail project at the site of the former Superfresh grocery store at 48th and Yuma Streets. Current plans for the site include up to 250 residential units and ground floor retail, including space for a new grocer. In a flyer distributed by email, Valor writes under the header “Bring Back a Full Service Grocer to AU Park” that it intends at tonight’s meeting to address: the design and scale of the building, the benefits of grocery store-anchored mixed use projects, traffic mitigation and parking plans, and affordable housing to be included in the project. Valor last came before the ANC in September. Georgetown Day School, which filed a Planned Unit Development application on November 4 for the expansion of its campus and development of a new commercial project, will also come before the commission. The ANC, in principle, has been fairly supportive of GDS’ plans, but wrote in an October 14 letter to the school that “several aspects of the GDS proposal continue to cause concern including the proposed taking of public space, the loss of tax revenue, and the impact of increased traffic on the neighborhood.” We anticipate that the commission will reiterate its call on GDS to ensure there is no net increase in vehicle traffic to the school, as well as to raise the question of public amenities. Among the amenities GDS cites in the PUD filing are improved streetscaping and landscaping, creation of new retail and residences, and establishing a community gathering space at the Davenport Steps – a pedestrian and retail plaza between the two proposed residential/retail buildings – and a new pocket park on Ellicott Street. While the improvements to the existing wasteland of surface parking and industrial style buildings will certainly benefit the community – even if community members disagree on the size, scope, and style of the project – it can be argued that these improvements also are essential for GDS to ensure the success of the mixed-use project, a revenue generator for the school, and to attract students and families to its campus. Other offered amenities, such as reasonable access to school facilities and preference in admissions to comparably qualified neighborhood children, seem more in line with the spirit of public amenities, but perhaps do not meet the bar previously set by the ANC. At the September meeting, Commissioner Jonathan McHugh told GDS “we are really short on amenities right now,” with Commissioner Jonathan Bender echoing that he was disappointed by the trade-offs being offered for the take over of public space. “I don’t think the Davenport Steps are a good trade,” said Bender at the meeting. Affordable housing and the mix of housing at the commercial development definitely will come up as commissioners are slated to discuss and potentially vote on a letter to GDS on these issues. As currently conceived, residential units would vary in size from 600 to 1200 sq. ft., with an average unit size of 680 sq. ft., according to statements by GDS Head of School Russell Shaw at a September 21 community meeting. GDS intends to set aside 8% of gross floor area for affordable housing units, as required by Inclusionary Zoning Regulations, with half reserved for low-income households and half for moderate-income households. Based on the average unit size, up to 28 residences – or roughly 10% of total units – would be available for those who qualify for affordable housing. At the September meeting, Shaw said that while the school had seriously considered increasing affordable housing units, ultimately it decided to adhere to the minimum percentage required. 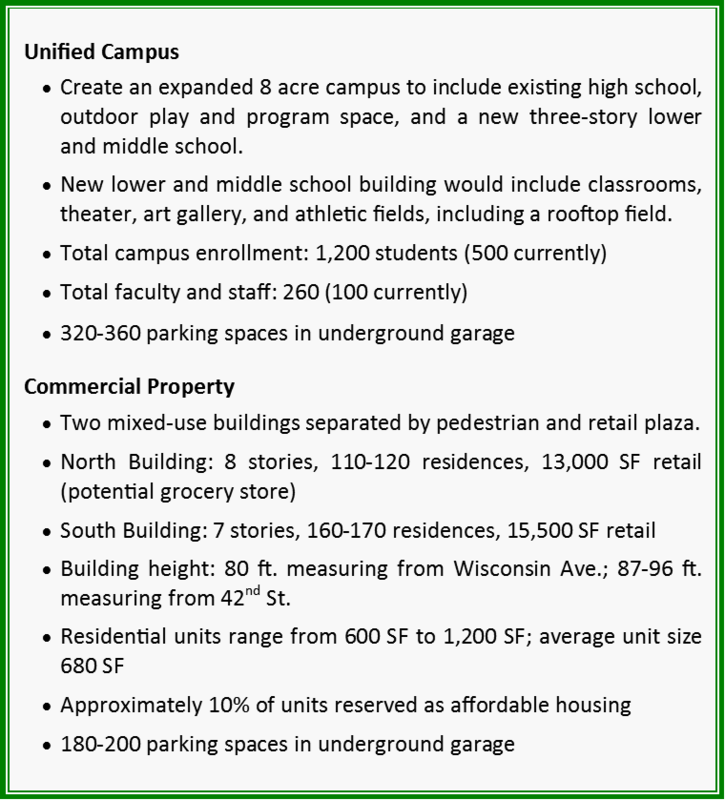 GDS envisions the mixed-use development, in part, as a revenue stream that will help the school maximize financial aid provided to students. According to the PUD filing, GDS currently offers $6 million in aid annually. The meeting will take place in the Chevy Chase Ballroom at the Embassy Suites in Friendship Heights. Upon entering the building, take the elevator (or escalator) to the second floor. Once on the second floor landing, take the elevator to the third floor. Turn right after exiting the elevator, then turn left down the hall for the Chevy Chase Ballroom, which will be on the left down a hallway. Hotel staff at the front desk on the second floor can help you find your way if you get turned around.